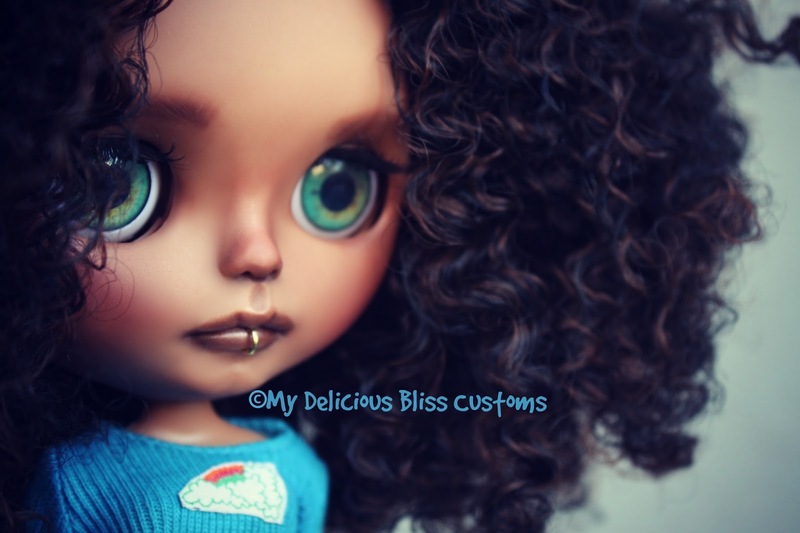 Introducing Emilia, a "Beautiful Brown Blythe" Custom. Emilia loves outdoor adventures, traveling and hanging out with her friends. Emilia is custom created from Neo sized Factory Tanned Blythe parts. 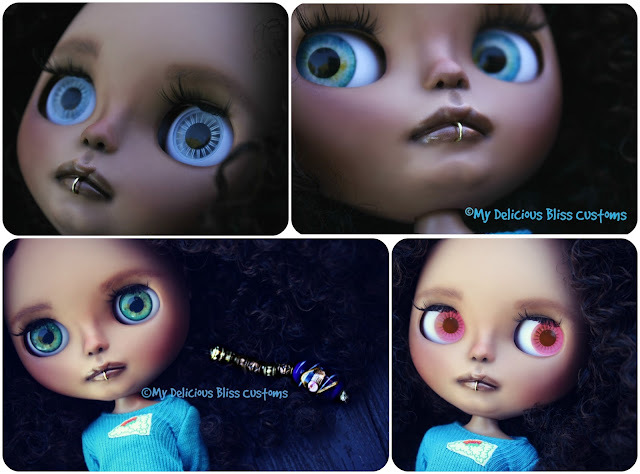 She has a special lip piercing and a head of soft, bouncy synthetic curls and stands 28.5cm tall. 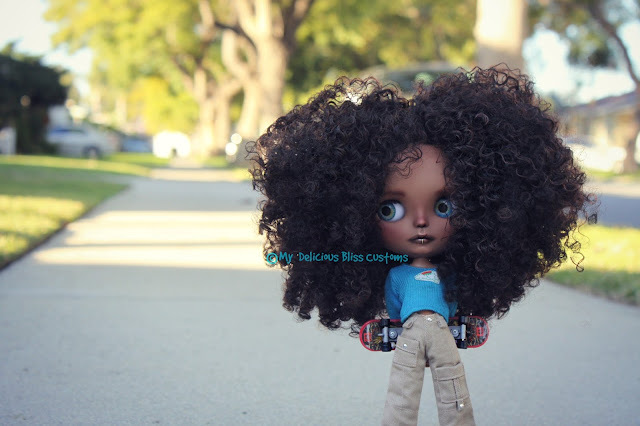 She will travel in a Vintage World of Love Shirt and Lonely Hearts Cargo Pants with Socks and Lonely Hearts Shoes and a dragon skateboard as in the photos. Emilia has a soft and bouncy Scalp of Synthetic Curls in brown with a bit of highlights in the sun. This body is not painted and can be handled easily with out damage. Jewelry Grade Charm featuring Coppery Gold Toned Metal Filigree Charms with coppery brown metal accent beads with a Venetian Glass Hand painted Charm. Her head must be held firmly in one hand while pulling the strings with the other to keep her head stable while changing the eyes. 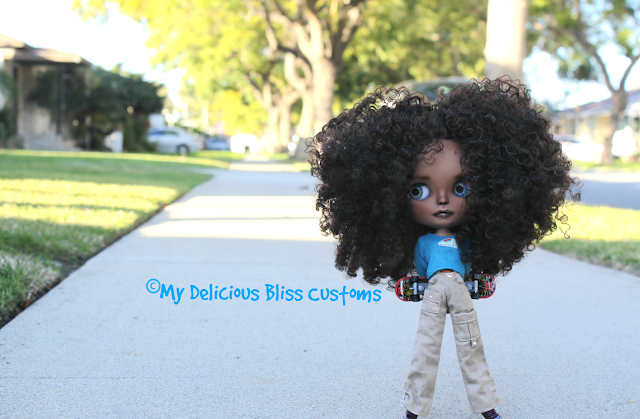 ~~~This Art Doll is for the YOUTH AND ADULT Doll Collector, due to small movable parts and her finishings. Please be aware she is a handmade Art Doll and not factory perfect. She was customized made by hand and not produced in a factory. She should be handled with care as not to damage her finish. Any imperfections you may notice are a result of the handmade process and due to the nature of materials and methods used in creating my face-ups, there could possibly be minor imperfections such as small amounts of dust, stray pastel, sanding blems or paint build up, they can also be slightly asymmetric also, so please be aware of this if it bothers you do not purchase.